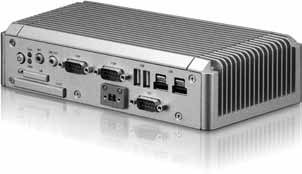 Able to operate completely fanlessly within a robust chassis, the VIA AMOS-3002 leverages the digital excellence of the VIA EPIA-P900 Pico-ITX board, combining a 1.0GHz Eden X2 processor and the VX900H media system processor, to provide customers with an embedded system that delivers all the latest features and digital media standards required for a diversified range of embedded applications including telematics, in-vehicle control, machine to machine controller (M2M), digital signage and kiosks. Storage is provided through a Cfast slot for a flash drive while an optional storage sub-system expansion chassis offers support for a standard 2.5" SATA drive. Comprehensive I/O functions on front and rear panels make the AMOS-3002 a flexible solution for a wide range of embedded applications. Front I/O includes, two COM ports, one Cfast slot, four USB 2.0 ports, including two lockable ports for increased ruggedization, line-in/out, and one DIO port, while rear I/O includes, one VGA and one HDMI port, two GLAN ports for dual Gigabit networking and a further 2 USB 2.0 ports. Optional Wi-Fi and 3G networking are available through a MiniPCIe expansion slot. Note*: The AMOS-3002 is also available with the use of a EPIA-P830 Pico-ITX board featuring a 1.0GHz Nano E-Series processor for an increased operating temperature range up to 70°C.